TaylorMade Golf sells the most golf equipment around the world by quite a big margin but frankly most golfers probably have TMaG’s top selling drivers come to mind when they think of the company. That perception could be changing. With the introduction of the RSi iron models TMaG, in the o pinion of some, takes “forgiveness” to a new level and after some 250 on-course swings with the RSis over 10 rounds and maybe twice that number on the range I can say they are something special. TMaG had been showing it understood sole slots and cavities and perimeter weighting in irons with their models in the immediate past: RocketBladez, SpeedBlade and SLDR. They also understood even professionals don’t contact the ball in the center of the club face every time and amateurs in fact hit the sweet spot less than one-third of the time. The goal became to add to the size of the sweet spot beginning with how the head weight was distributed which lead to cavity back, plugs and ultimately slots in the sole, all of which now is pretty much standard stuff and done by most every club maker. Enter the groundbreaking idea for the RSi model, namely slots in the face to really enlarge the sweet spot making them the easiest irons to play I have ever hit. 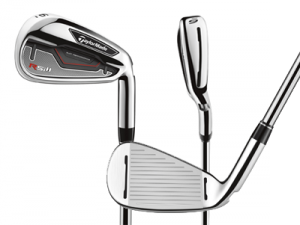 Found in the 3- through 8-irons the face slots combined with a tweaking of the sole slot have made a difference in my iron game for two reasons. First is the tra jectory is exactly what I look for and particularly in those instances where the impact was a little low on the face the ball still got up in the air a reasonable amount. Not perfectly and that’s not to be expected but with enough height to produce an “average” shot but maybe best of all with sufficient spin to check fairly well on the green. 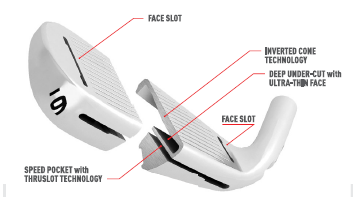 Just as important, because of the added flexing of the face allowed by the new face slots, I have gained distance; not the credibility-testing “these new irons are two clubs longer” kind but a solid, reliable one-half a club over the SpeedBlades I was playing. I tested the RSi 1 model game-improvement category irons though there are RSi 2 and RSi TP models in the stable as well. 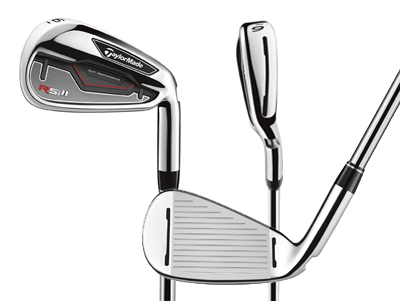 The test set of 4-iron through pitching wedge with ReAx steel shafts is $700. Recommendation: Irons are the key to scoring and the RSi models should be on everyone’s list to evaluate…they are that good. My experience can be summed up by the fact I have gained added confidence in my iron game to the extent I pulled a 4-hybrid from my bag substituting the RSi 4-iron because I can be sure of hitting it the correct distance and there’s an added benefit. After one of those almost too rare to mention pull-hook drives I have been known for—rare being defined as not more than three times per round. It’s a comfort having the 4-iron in the bag for the ever popular under-the-tree-punch-it-out shots.